The change took effect last week at some of the Disney monorail hotels – the Grand Floridian Resort & Spa, Polynesian Village Resort, Contemporary Resort and its connected Bay Lake Tower. Guests experienced the updated security policies which include the removal of the “Do Not Disturb” door markers. 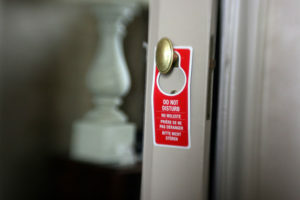 They have been replaced by “Room Occupied” signs that will alert maintenance or housekeeping workers that guests are currently in their rooms but will not stop the hotel staff from coming in. Under the new guidelines, a hotel worker must knock and identify themselves before entering if the “Room Occupied” sign is out. The new arrival guests are being notified about the updated guidelines, the company said. The tighter security measures come as a response to the Las Vegas shooting at Mandalay Bay where a few weeks ago, a gunman shot from the 32nd floor of the casino-hotel tower and killed 58 people. Disney officials declined to say why they are introducing the new policies, although they said the decision was made for a variety of factors, including guests’ safety and security.